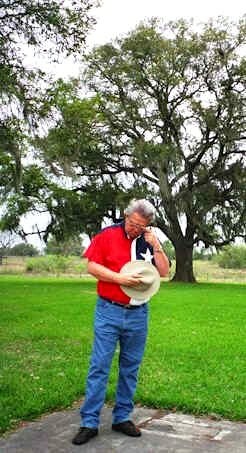 "Under this tree, near West Columbia, Texas, a Texas Historical Monument marks the place where Austin died December 27, 1836"
Often referred to as the Father of Texas, for the hundreds of families he brought into this state due to the relatively poor economic conditions in the United States at the time, Stephen F. Austin was very successful in recruiting families to move to Texas. On the death (1821) of his father, Moses Austin, he took over a grant to bring U.S. settlers into Spanish Texas. Under the terms of a special act in 1824 and additional contracts in 1825, 1827, and 1828--all granted by the newly independent Mexican government--the colonizer was responsible for the settlement of more than 1,200 American families in Mexican Texas. 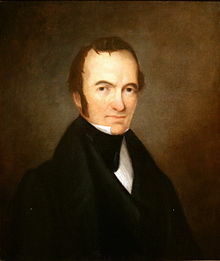 Stephen F. Austin died December 27th 1836 in the home of George B. McKinstry. The McKinstry home is locate a few miles out side of the then Capital of Texas, Columbia. Austin at the time of his death was serving as the Secretary of State of the recently formed "Republic of Texas". On Christmas eve Austin had taken to bed with a chill and sank quickly into fever and delirium. About noon of the 27th of December he raised from his pallet next to the fireplace and proclaimed, "Texas is recognized! Did you see it in the papers?" and died. Upon his death the President of the Republic of Texas Sam Houston said, "The father of the Texas is no more! The first pioneers of the wilderness has departed! General Stephen F. Austin, Secretary of State, expired this day." because of "his high standing, undeviating moral rectitude ... untiring zeal and valuable service," Houston also ordered a thirty-day period of mourning with all civil and military officers to wear crepe on their right arms and every post and garrison to fire a twenty-three gun salute - one for each county. Stephen F. Austin's death place location: About one mile north of West Columbia, Texas on Highway 36. N 29° 09' 21.2" W 095° 39'13.9"